Most families have one in their fold. There’s at least one member that refuses to conform and perhaps even lacks a resemblance to their siblings or parents. They’re born rebels (with a cause and without) and non-conformity is their middle name. They set their own standards and live by their own lights. They are argumentative and a challenge to their parents – original thinkers and entrepreneurs of the future. They are as much a source of irritation and inspiration. They spend their lives ignored, undervalued and laughed at. Some are introverts and some extreme exhibitionists. No two black sheep- are the same. Each has a unique destiny which can verge on the sublime to the overtly awkward. Even when they fail; they fail in a spectacular fashion. And when they succeed, the sky’s the limit! They are not comfortable in the family pen; no matter how luxurious it may be. They often reject wealth to pursue a life of austerity. Many a nobleman’s son has become a great saint, think St Francis of Assisi and Siddhartha (who later became the Buddha). These and whole host of difficult characters have risen to heights never forseen. There’s many a dropout that has made good in their chosen sectors – think Mark Zuckerberg, ex-Harvard student and founder of Facebook and Bill Gates, the richest man in the world! 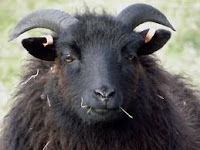 These “black sheep” have alter egos of genius, prodigy, dysfunctional, loser and bum. Any pioneer or prisoner( on death row) has been a black sheep? Are black sheep born or made? It’s a tricky one but my money’s on genetic inheritance. They present a whole range of problems to their families and the wider community. They are either loved or hated – opinions are very divided. Parents grit their teeth whenever they get into a debate with their adorable offspring who know how to push their buttons. It’s hard to keep your temper around them let alone your sanity. Siblings wonder if these misfits were switched at birth and that an imposter is living in their midst. Having a black sheep can be both positive and negative – high achievers or renegades? They are a force to be reckoned with. Hopefully they are not in decline or increasing in alarming numbers to pose any threat to the sociological landscape. I secretly hope there’s one amidst my flock and that I can survive them long enough to be proud of them.